For breakouts I decided to pick up the little tube of Sudocrem because it's just so much handier than the huge tub, plus dipping my nails into the tub just doesn't seem very hygienic. While I find this does help a little with spots I don't use it a lot as it does take a little time to help reduce the size of your spots. Face masks are my favourite thing, but I done a good job and narrowed it down to three. Starting with Glamglow. I don't think I've ever been more in love and obsessed with a face mask in my life. This is the miniature version of the Hydrating Mask and the fact that you can go to sleep wearing it like just makes my life. It leaves my skin feeling absolutely amazing and as soon as I finish this tub I'm definitely treating myself to the full sized version. Another mask I've been loving is the L'oreal Clay Masks particularly the Detox mask. I will admit I am so lazy when it comes to mud masks, because it means I have to take time taking them off, but this one is brilliant. I only use it once a week but I find it really helps my skin especially if I find some breakouts occurring. Finally the one I cant recommend enough to anyone the Garnier Moisture Bomb Tissue Mask. These are so affordable and so refreshing. You only need to use one a week because of the amount of product absorbed in the mask, and the fact that it's a tissue mask means it's fuss and mess free. I basically have a stock pile of these because they're such a great price and I just cannot get enough of them. Micellar Waters are my favourite invention ever. Right now I currently have four different bottles in my skincare cabinet and I love them for when I'm wanting something to remove my makeup fast. Garnier are killing it right now with their skincare products, and released their Micellar Water in a cleansing gel wash. This is the most genius product I've ever come across to be honest. It's 10 times quicker removing your makeup than an actual micellar water and it doesn't leave your skin feeling dry or irritated after using it. I wrote a whole post about my thoughts on the product which you can find here. The Garnier Micellar Water is something I always have close by as it is affordable and gets the job done. Right now I'm so obsessed with the gel wash that I usually just go over my face with some Micellar Water on a cotton pad just to make sure I haven't missed anything. They've also released this in a 700ml bottle which is blooming amazing because I fly through the 500ml bottles so at least the 700ml would last that little bit longer. Kind of a micellar water but kind of not, the No7 Oil Free Eye Makeup Remover is my go to. I don't tend to use normal Micellar Waters to remove my eye makeup as sometimes I find they're just not strong enough for the waterproof products. The No7 eye makeup remover is my absolute favourite. As it's oil free it doesn't irritate my mega sensitive eyes and it removes my eye makeup waterproof or not really easily. I've fallen back in love with the Liz Earle cleanse and polish and do love taking my makeup off using it. Although I'm not a fan of the scent which I think they could have done a bit of a better job on but I do find it removes my makeup completely and when I go back over my face with some Micellar Water theres no traces of anything left behind. Although I have to be in my not so lazy mood to use it but when I do I really enjoy it. Finally for moisturisers, starting with the No7 Essential Moisture. This is just your plain old moisturiser, theres nothing really special about it and I bought it just to kind of have a moisturiser. 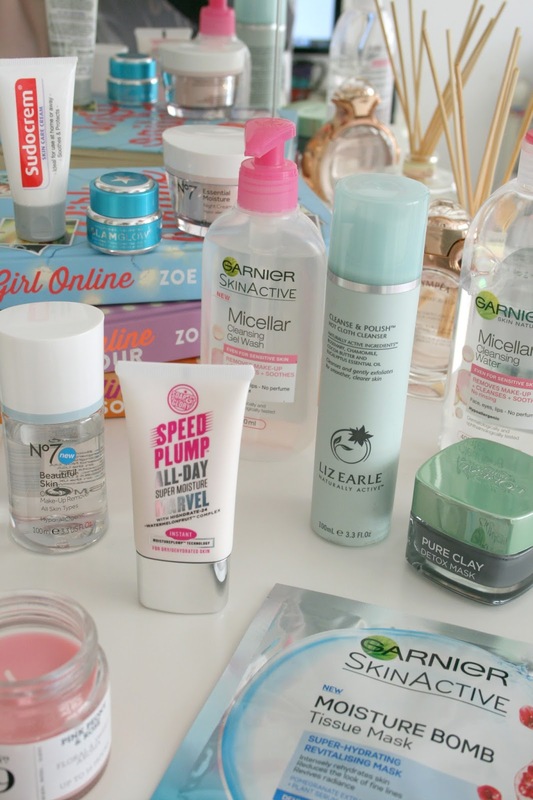 I'm not great at putting on moisturiser and normally do skip the step which I know is bad but sometimes I'm really good and go through my whole skincare routine...I swear! The Soap and Glory Speed Plump all day has changed my attitude towards moisturisers and ever since receiving this at Christmas I haven't stopped using it. I absolutely love it, it leaves my skin feeling nice and hydrated and it smells like orange starburst! Although still to this day I'm not entirely sure if I'm supposed to use it as a primer or a moisturiser but I am truly enjoying it and can see myself ordering another one when this runs out. So thats everything I was using during January, while more were used than others I do 100% recommend each and every one of them. They are all in a few different price brackets but they're all worth it. I love glsmglow so much! It just works SO well!! !